The choices retailers are making and the debate surrounding those choices seem to indicate that the intersection of comic retailers, fans, creators and publishers isn't what it used to be. It's more political, more vibrant and perhaps more acrimonious than it's ever been. 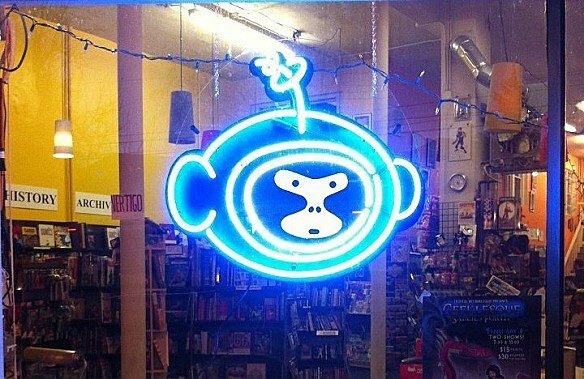 In this fourth part of a series of interviews with retailers here at ComicsAlliance, we spoke with Adam Healy, co-owner and manager of Cosmic Monkey Comics in Portland, Ore., a store that will sell the comic when it comes out May 29.ComicsAlliance: In your comments to the Portland Mercury, you said, "It is the curse of the comics retailer to have to carry a variety of material that includes offensive and/or embarrassing works." The message there seems to be that you feel you don't really have a lot of choice in the matter. Why do you feel that way? Adam Healy: As a comics retailer, it is our responsibility -- mine and [co-owner Andy Johnson's] -- to serve the needs of our customers. We take customer service very seriously, and carrying the items our customers desire is our top priority. Personally, I have limited time for reading comics and find that many superhero books carry little to no appeal for me. There are exceptions, and plenty of them, but most books are still dudes in underwear threatening to punch each other because their feelings are hurt. Marvel and DC combined are putting out in excess of 200 books a month. I would argue they are flooding the market and run the risk of burning out their very small, but very loyal customer base. CA: You did say you're choosing to stock a limited number of copies, mainly just pre-orders. Is it the customer who ultimately dictates what you sell? Is part of your decision worry about losing customers? AH: We worry about not being able to satisfy our customers more than losing customers. We stock fairly low numbers on the shelf of most of the books DC and Marvel publish. They put out so many books that they compete against each other and lose. We simply can't afford to stock most books more than lightly since we have no evidence that there is a demand for the product beyond what our pre-orders are for each book. Realistically, without the media attention, an Orson Scott Card-written Superman book is not something that would sell well. Superman is a character that lacks the social relevance he had 75 years ago. People don't know what he stands for or why he does what he does, and current storylines do nothing to address this confusion. CA: With that in mind, do you think the people have been really outspoken against it have made a mistake, or caused some unintended consequences, by drawing so much attention to it? AH: Not at all. I think people speaking out against it have done us all a favor by instigating a dialogue about how values inform decision making by readers and retailers. I applaud those who have taken a stand against Card and his reprehensible views. I doubt the powers that be at DC will listen or care. As far as unintended consequences, I would hope that Chris Samnee suffers no blowback. He is one of the best artists working right now and I know people are looking forward to his work on this series. He used to live in our neighborhood. I can attest he is a stellar human being, and we miss seeing him in the store. CA: Can you imagine something coming out that would be objectionable enough not to sell it? AH: No. If you've seen Crossed, then you understand. There are books that we don't stock over pre-orders because there is no demand for them, but if the customers want it, we try to carry it. We are a family friendly store, with two separate all ages sections, so we are very sensitive to keeping overly sexual or violent images out of sight. CA: The customer-first approach has been part of retail for a long, long time, but comics retailers themselves are certainly gaining a little more voice, wouldn't you say? Just a few years ago, when Card wrote for Marvel, none of this huge debate occurred. AH: Retail began with a customer first approach, maybe, but since the Industrial Revolution ushered in mass production, much of commerce centers around trying to convince the customer they want something that they don't need. I don't see that retailers have gained any voice, especially with Diamond Comics Distribution, the company that holds a monopoly on comic distribution in North America. The same is true with the major publishers. They do what they want to do and have little or no concern with retailer reaction unless it affects how much we buy from them. In America, the retailers are the customers, and the publishers don't concern themselves with whether or not we sell what we buy from them. All sales figures reported by Diamond are retail orders, not sales to readers or collectors. Many publishers have learned how to artificially inflate sales by offering variant covers as incentives to increase orders. As far as I can see, the Card issue is a tiny debate that matters little to most readers. I honestly feel that retailers have little to no voice with the publishers. CA: But people are learning a lot more about the places they buy comics through Twitter, Facebook and the like. On the one hand, that can build stronger customer relationships; on the other, strong opinions on issues that reach beyond who the Hulk can beat up can be divisive (the topic of who the Hulk can beat up can raise some hackles itself). Do you find that risky or scary? AH: Nothing risky or scary about it. I think Twitter and Facebook create opportunities for retailers and their customers to connect and communicate, but social media, by design, makes it difficult to have educated and reasonable discussions about anything. There are very few places to find more than a short introduction or discussion of any real issues facing comics as a community or a marketplace. I think this is a systemic problem in modern society, where too few have a thorough knowledge of where comics came from, how we got to where we are and what will get us to the next level. When people start arguing about who the Hulk can beat up, I recuse myself from the conversation. Though not a subject I care to discuss, I wouldn't want to ruin someone's fun and be a Debbie Downer. CA: What I find particularly fascinating about this whole thing is how it seems to be forcing customers and retailers to make a decision. It's really hard to ignore. If the media isn't asking you about it, your customers definitely are. Even if you choose to keep quiet about it, as some of your competitors did, that's a decision in itself. Do you think more decisions like this are coming? Is this environment, where social beliefs drive buying and selling decisions, just how things are going to be now? That certainly seems to be the case in the fast food industry. AH: Aside from you and Erik [Henriksen, of the Portland Mercury], no one has brought this issue up anywhere around me. I don't think more than a handful of customers care about it. Comics creators are almost all white, middle-class males, and as a result, mainstream comics in America have a notable racial and gender bias, which to me explains why sales are incredibly low. The Avengers movie grossed almost 3 times what the entire comics market made last year. At best, we're dealing with a pool of maybe 300,000 regular comics readers. It is a tiny market, kept small by the narrow, overly simplistic views expressed in most comics. I would argue that the astonishingly low sales of most comics coming out supports this claim. Regarding decision-making based on values, I would hope that this is how all reasonable people make decisions, and there was a time in American business when this was assumed. At some point, commerce and values became disconnected. It is in everyone's self interest that the greater good be acknowledged and served. I am concerned that this is even a topic of discussion. Are there people who don't make decisions based on values? Certainly, there are people of low moral character who make decisions that are easily recognizable as being indefensible from any value based viewpoint, unless profit and self-worship are your only values. Overall, I would argue that the majority of the problems we face as a nation and a people are the result of divesting commerce of standard human values, as if business conduct has no impact on our lives. The problem, as I see it, is that Americans have become overly emotional about disagreements. It is healthy and productive to have debates with people who don't share your opinion. We should all be happy for the opportunity to hear opposing views and consider them, and if our opinion is not swayed, we should be able to articulate why without getting upset and calling someone names. All thoughtful human behavior should come from value and/or reason-based judgement and decision making, and I think most of it does. Perhaps the pendulum is swinging toward a position where more and more consumer choices are based on informed decisions rather than impulse gratification. I would love to see this become the new normal. As a business, we have never put profit first. We have always believed that reward follows good work. We serve our customers because we genuinely love what we do, and we love to showcase the creative and brilliant work being produced today. Many of the comic artists and writers working today probably have views that we find offensive and demeaning, and a few of them definitely do, which is why we're having this discussion. Being exposed to offensive and contrary ideas is what makes an open society great. Ideally, such expressions would seem foolish against the backdrop of a wealth of articulate, well constructed counter arguments. That is the case with the beliefs of Orson Scott Card. I would go as far as to say the values expressed in his stories contradict his personal beliefs as they are expressed in the media. I have to admit I am unfamiliar with his exact beliefs. I avoid being exposed to people like him because it makes me sad. There are far more interesting and uplifting people to pay attention to. People who state beliefs without being able to support them with a reasoned argument are boring. To wrap up, publishers dictate the market conditions by their behavior. The comics market has few, if any, concrete statistics on readership. There is an astonishing lack of knowledge about the unique structure of the comics market, among even those employed by comics publishers. Comics have the potential to be the highest form of human expression, and are undeniably the beginnings of written expression, like hieroglyphics. CA: What are some comics you're really looking forward to selling? AH: In the coming months, I am looking forward to more Saga, Prophet and Manhattan Projects. Hawkeye is making people very happy, because it is great.